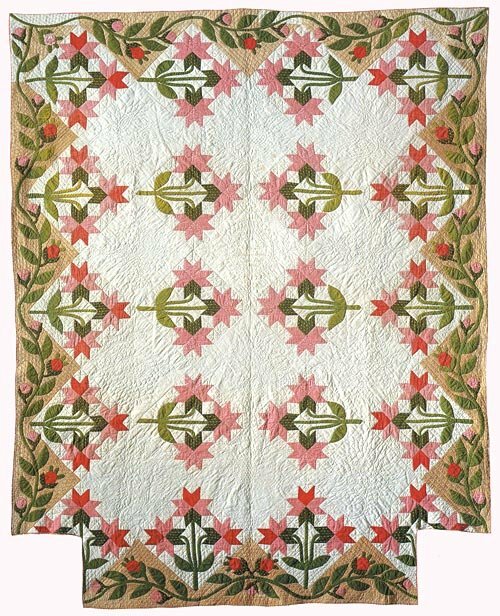 Beautifully executed buds, leaves, and vines appliqued over border triangles set this Peony Quilt (80" x 100") apart from other pieced quilts of the time. Catherine Graves Brockway Bolster used a successful, yet bold and novel approach for a which was traditionally made on a white background. As a result, a quilt was created! Make the quilt in the popular double pink reproduction fabrics available now and create a true reproduction! Nearly each plain block is quilted in a different design, with the middle one being Catherine's signature block. Her beautiful wreath stencil that creates this block is included with the pattern, with the ten other available as a separate package. Hand and quick-piecing instructions are given as are directions for filling in the corners of the " T" shape if desired. Acrylic templates for the Peony Quilt are also available! Authentic Civil War era quilting stencils from the Peony Quilt available!